One coat of Prelude Clear Wood Primer fills the pores of the wood and provides a surface that enables you to obtain a more uniform finish color over the entire home. 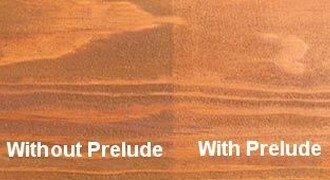 Prelude is ideal for both interior and exterior wood surfaces. Prelude Clear Wood Primer also contains UV Boost for added UV protection. Prelude is a primer and should never be used as a final finish. For use exclusively with Lifeline wood finishes.